Do you find music and dancing lift your spirits? If so, would you like to help others enjoy the same feelings? A growing body of research is showing how dancing can improve physical and emotional well-being in later years. Dancing for Wellbeing offers group members the company and friendship of people in similar circumstances, safe and gentle exercise, an opportunity to relax, feel uplifted, and above all to just have fun! As a volunteer you would be providing much appreciated help with practical tasks and with social support and encouragement to make every session enjoyable and safe for everyone. 1. Meeting and greeting group members, taking money and completing a register. 2. Helping members to their seats if necessary and sorting out seats for any latecomers. 3. Being welcoming and encouraging to new and existing members, helping to create a relaxing, happy atmosphere and helping everyone feel they belong and are valued within their group. 4. Making and serving refreshments, clear away, wash up and tidy up. (Sessions include an hour of dancing followed by half-an- hour of socialising and refreshments). 5. Helping to move chairs and tables. 6. Helping with occasional parties and events. You will volunteer with the group Facilitator together with 1 or 2 fellow volunteers. Volunteers are attached to one particular group but it would be good to have volunteers who are willing and able to cover at different groups for sickness or holidays. Experience of volunteering or of personal/family relationships with older people, disabled people or people with dementia would be useful. However, it is more important for volunteers to have good interpersonal skills, non-judgemental attitudes, to be attentive/alert to the needs of members and to safety issues, to be warm, friendly and interested in people, and to enjoy chatting, listening and laughing. Volunteers need to be willing and able to make and serve teas, coffees and biscuits and wash up and tidy up afterwards. They need to be able to handle money and give the correct change. Keeping calm under pressure can be important at times, e.g. when a lot of members arrive at the same time and don't have the right money with them! Honesty and reliability are essential qualities. 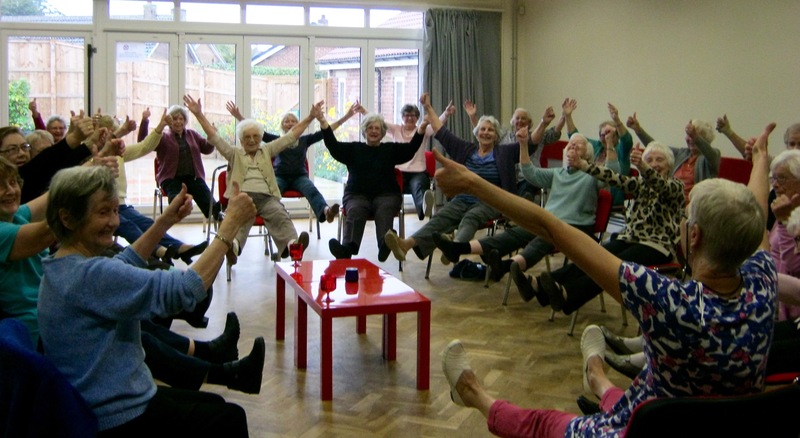 Dancing for Well-Being groups are ideal for older people with mobility or health problems who find other dance or exercise classes too strenuous or challenging. You can dance SITTING or STANDING, you can move at your level, you don't need a partner and you don't need a good memory. Dancing for Well-Being is safe and gentle, it's great for company and friendship, it's relaxing and uplifting, but most important of all it's FUN!